9.3 out of 10 based on 12 user ratings by TrustMark. A deluxe penthouse refurbishment located in the City of London, with impressive views of London’s skyline and its surroundings. Our young, professional client wanted to achieve a fresher look to the penthouse, so part of our brief was to renovate the property and give it the fashionable appearance it was lacking. The original décor was outdated, and did not reflect the standard of properties in the location, or seen on sale on websites such as Zoopla, Rightmove or Gumtree. It was up to Sigma Construction UK to update this property and bring it up to the standard of a luxury penthouse. The focal point of the apartment is a central staircase, which we redesigned in glass, and illuminated it, creating a stunning visual effect, but which also fits in very well with the rest of the interior. The large windows, which on their own produce a beautiful effect, combine with the illuminated staircase to add a grandeur to the space. Sigma Construction of London recognize that each client has unique needs, thus they take a unique approach to each brief presented to them. As an established building company we are able to overcome any special requirements that we are faced with—and this renovation is a prime example. 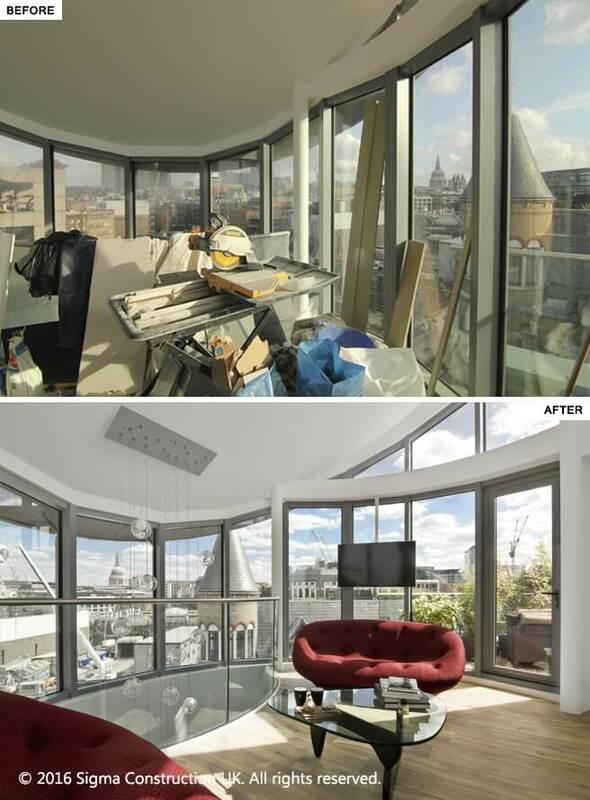 For instance, to complement the curved shape of this City of London apartment, we installed a bespoke circular kitchen, which gives our client the facility to simultaneously cook and admire the beautiful views. Incidentally, the dining table was itself positioned to take the best advantage of the view. 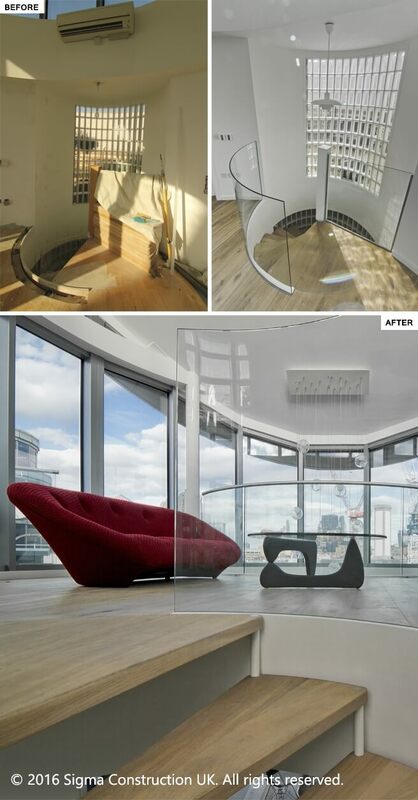 The penthouse being circular meant it down to our interior designers to furnish the space in the best possible way. We managed to overcome the one or two issues and queries that emerged during the process and provided practical answers. In a space like this, where standard furniture would simply look odd, our team did their research and sourced best possible furnishing solutions for the property: as seen in the photos, the furniture fits in seamlessly. Our team of professional builders and designers even took the trouble to find a sofa that would best complement the space, and opted for an unusual Ligne Roset Ploum Sofa, which enhances the curves in the structure of the apartment. The TV has been unobtrusively suspended—an effective and ultra-contemporary alternative to a TV stand—yet is still a focal point, allowing the viewer to watch comfortably. A glass and wood table centre-piece adds depth and colour; in addition, the glass gives it lightness while the dark base adds an edge. 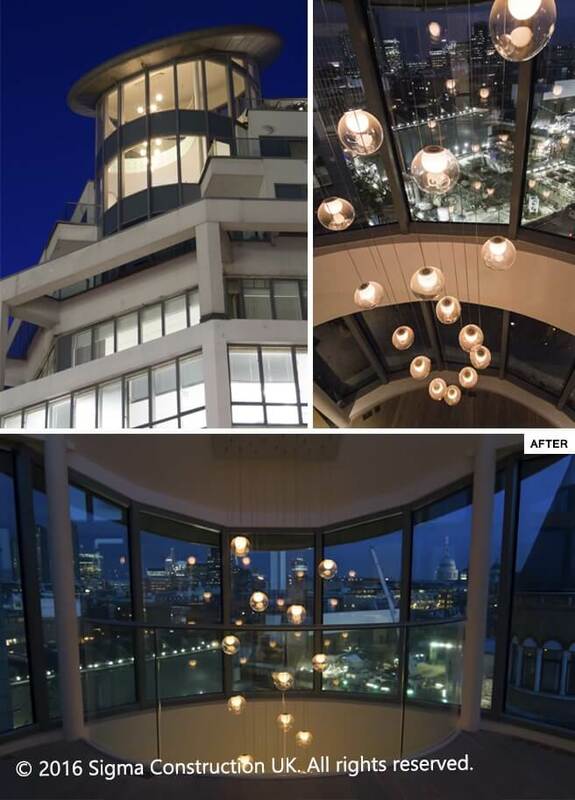 Apart from the amazing views in this City of London penthouse, the focal point is doubtless the link between the two floors with the double height floor ceiling which is enhanced by the magnificent chandelier our team sourced from Bocci, consisting of stunning offer an eye-catching effect from both the inside and outside. The bathroom we designed is highly practical, with a built in bath and an adjustable glass panel to also give our client the option of a shower. 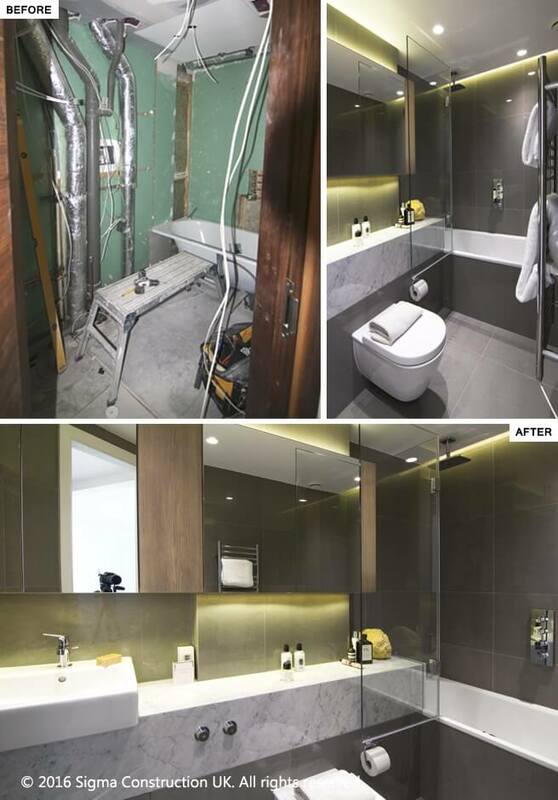 A fairly light colour palette was used throughout the apartment, but the bathroom is where we went for a slightly darker effect, with a mixture of dark grey tiles and a pop of marble on the vanity unit and chrome sanitary ware. Should you have a house or an apartment for renovation or for sale, Sigma Construction UK would be delighted to help you. We are a UK-based company, and as well established in the residential sector as Balfour Beatty or Carillion are in world of commercial construction. With the most skilled designers and builders in London we have the advantage of being able to deliver high-end residential architecture, renovations, and interior design and delivery services within our integrated "turn-key” packages. Sigma are a well-established building company, involved in the construction industry on a daily basis. We are up-to-date with all the construction news, and the newest techniques, technologies and trends, and therefore able to offer you the best possible service. Please visit our website where you can view our latest news and projects we have worked on: our online construction database allows new and potential clients to see what we have the capacity and capability to do.